The notion of your wee dwarf hamster making high-pitched chirping, squealing and squeaking sounds may seem rather cute and endearing. However, the cause of these vocalizations isn't always positive, which is why it's so extremely important to always take note of your pet hammie's communication clues, from chirping and beyond. A high-pitched chirping sound may sometimes indicate apprehension in hamsters. This type of vocalization is especially prevalent in hamsters that are new to a situation, although it may happen at any time. If you just brought a new dwarf hamster home and hear him making these sounds, it may just signify that he's feeling nervous and frightened at the moment, whether you're attempting to physically touch him or clean out food remnants from his cage. Fearful hamsters may bite in these types of situations, so let him be and stop touching him immediately. Always be very cautious around scared hammies. 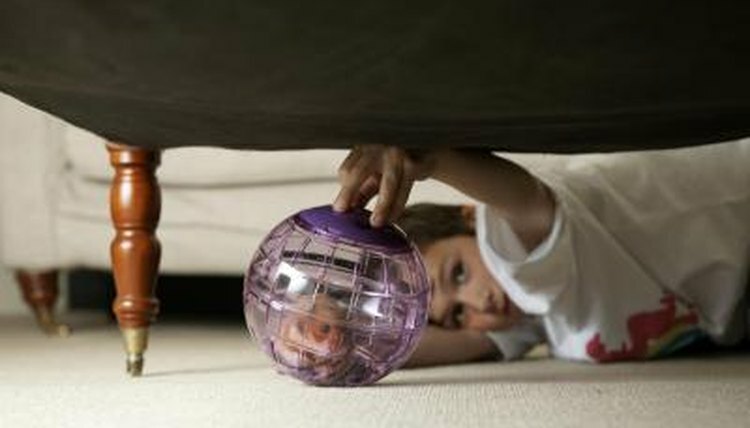 Fortunately, this fearful behavior typically subsides as a hamster gets used to his living circumstances -- and to you. In the hamster world, dwarf hamsters typically are the most suited for living together, usually in pairs of two. Chirping is often a playful sound for hamsters. If you notice a hamster chirping amidst a short and frolicsome bickering session, he may just be enjoying a lighthearted fight for dominance within the "world" of the cage. If you observe chirping and other signs of potential physical harm, however, whether biting, running after or "trapping," then it's definitely time to place the pair into different cages, probably on a permanent basis. These behaviors are indications that the "playing" isn't really so playful after all. True fighting amidst hamsters can be extremely hazardous, and oftentimes even deadly, so take immediate action. Chirping also may be a sign of discontentment in dwarf hamsters. If you're stroking your dwarf hamster's back somewhere outside of his cage, for instance, and he starts chirping out of nowhere, he may be attempting to express to you that he's not enjoying the contact anymore and that he wants you to stop. If you think that this is the case, bring your tiny hammie back into his "safe haven" immediately. In some situations, chirping may be a warning sign that a dwarf hamster feels ill or otherwise unwell. Perhaps the little one has an injury somewhere on his body. Maybe he's suffering from a belly ache. Apart from vocalization, be attentive to other hints that your pet may need some help, including crouching over and difficulties with elimination. If you suspect that something may be wrong with your hamster, notify your veterinarian of the situation as soon as possible.